If you are looking for a used Toyota Tundra in Orillia, Barrie and surrounding area, the Thor Motors sales team will be able to satisfy your needs. Thor Motors always has a great selection of pre-owned Toyota Tundra in stock and add to the vehicle inventory daily. At Thor Motors we proudly sell and service used Toyota Tundra to customers from Orillia, Barrie, Midland, Gravenhurst, Bracebridge, Newmarket, Parry Sound, Muskoka and Kawartha Lakes in Ontario. The Toyota Tundra is a full-size, half-ton pickup that raises the competitive bar in its class. It's built to Toyota's high standards of quality, durability and reliability. 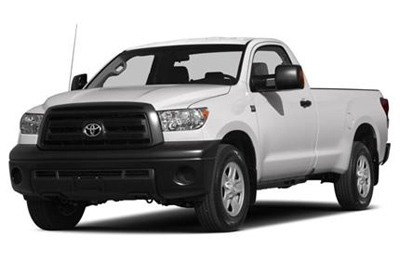 The Tundra is available in three different cab styles: the 2-door Regular Cab, and the 4-door Double Cab and CrewMax. The Regular and Double Cabs are available with either a 6.5-foot standard bed or an 8-foot long bed, while the CrewMax features a 5.5-foot short bed. Electronic, part-time four-wheel drive is offered on all V8-powered Tundras. The 270-hp 4.0-liter V6 sends power through a five-speed automatic transmission, while the 310-hp 4.6-liter V8 and the 381-hp 5.7-liter V8 feature a six-speed automatic. Three trims are available: the base Tundra Grade, the Limited and the Platinum. Available options include front and rear parking sensors, navigation system with backup camera, JBL audio systems, Bluetooth wireless connectivity, power moonroof, and a power memory feature. The Platinum trim includes all of these features, plus billet-style grille, unique 20-inch alloy wheels, ventilated seats with a unique perforated leather seating surface, wood trimmed interior and more. The new Tundra Work Truck Package is aimed at commercial truck buyers in industries such as farming, ranching and construction, or those who require a tough no-frills truck. Other optional packages include the TRD Offroad Package, Sport Appearance Package and a Towing Package.